Former Golf course is being offered for commercial and high density residential development. Adjacent to Interstate 94 (70,000 vpd) with municipal sewer and water services. Rolling landscape used historically for agriculture and golf club since 1960. Parcel Assemblage of up to 200 acres with 1.6 MILES - ROAD FRONTAGE - is possible for larger mixed use development. 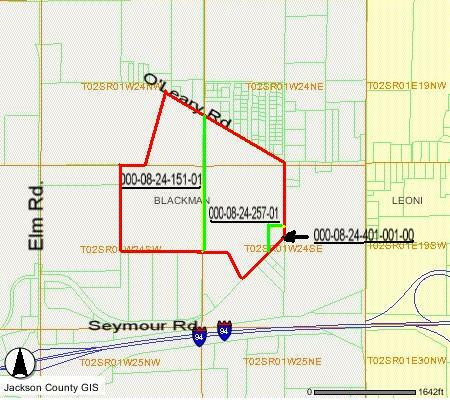 Blackman Charter Township location is within 30 minutes of Ann Arbor or East Lansing, 60 minutes to DTW Metro Airport, 40 minutes to Battle Creek Airport (International Port of Entry). 5 minutes to Jackson County Airport - offering private and charter jet services. 5 minutes to Armory Arts Cultural art center. Area new business's include, 4 new car auto dealerships, Medical offices, Corporate offices, 144 unit Apartment Complex, US Postal distribution Center, Convenience store, Planned 1,000 acre High Tech Industrial Park. JUST LISTED - 17 ACRES ADJACENT TO THE ABOVE PARCEL. GREAT VISIBILITY TO INTERSTATE 94, INCLUDES NICE BRICK RANCH HOME. SPLITS OR AN ASSEMBLAGE OF LARGER ACREAGE POSSIBLE. NEW NISSAN DEALERSHIP UNDER CONSTRUCTION ON PARCEL TO THE WEST. ACROSS THE STREET FROM NEW FORD LINCOLN MERCURY DEALERSHIP. SEWER AND WATER IN STREET. 17 Acres - Beautiful parcel adjacent to several new auto dealerships. Part of a former golf course property. Brick Ranch home included. Zoned for Highway commercial uses. Sewer and Water in the street. Click below to view MDOT plans (pdf) for new 4 lane bridge over Interstate 94 and new ingress / egress cloverleaf at this interchange. another example - a great parcel! !